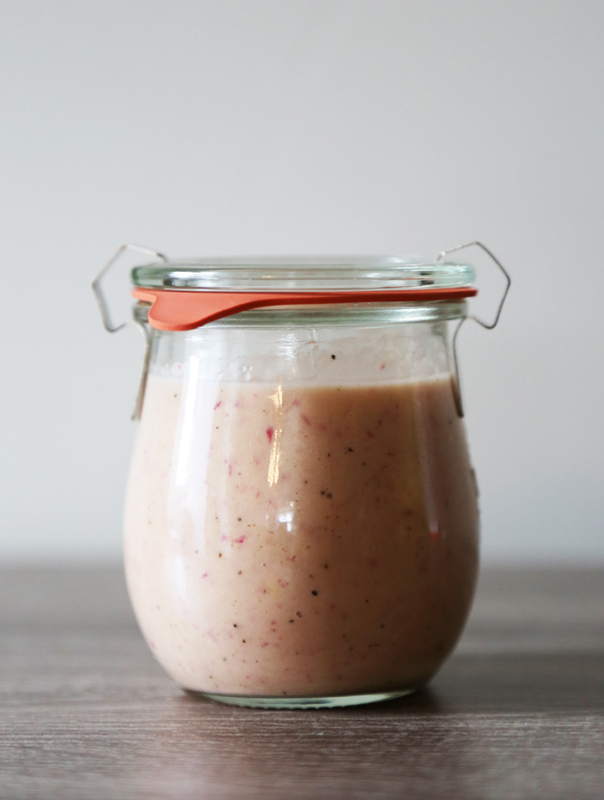 Red onion dressing makes so much sense the minute you think about it. It combines so many delicious things and it’s so easy! Why are we not eating this more?? I’ve decided to remedy this situation, and keep some on hand at all times. Like all good things, this recipe came directly from my mom. She brought me a jar and it was gone in less than a week. I immediately requested the recipe because I had to have more. It’s evolved a million different ways for a million different occasions. You can use it to dress your favorite salad, or dip fresh veggies in it for a snack. That’s what’s so great about it. You can tweak it to make it your own! I like to add garlic, but there are so many spice combinations you can work into it until it perfectly suits your needs. Just be prepared for it to be gone. Fast. Combine all ingredients in a food processor and process until desired texture is achieved. Alternative: If you don't have a blender or food processor: Finely mince the red onion. Whisk all ingredients together in a large bowl.